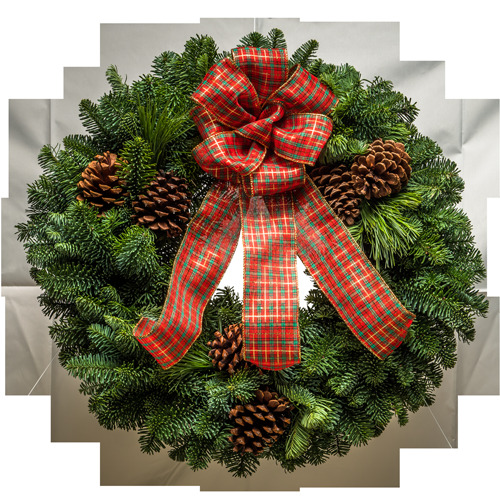 The Highlander Christmas wreath with a pretty plaid bow seems to usher in memories of holidays across the oceans and through the ages. This old-world Christmas wreath features aromatic noble fir and princess pine, and is made the old fashioned way. The luscious bow is painstakingly handcrafted with a traditional Tartan plaid ribbon. "I just want to let you know that I received my order yesterday and was I in for a big surprise. When I opened the box, I was in total shock. Miguel was the person who handcrafted my wreath and it is simply AWESOME!!! Please tell him a hundred thousand thank-yous. I can tell that he really loves his job by the way the wreath was created with all the care and creativity that was put into it. I am totally sold on Christmas Forest. Please extend my Christmas wishes to everybody in your company for doing such a great job."